T.C. 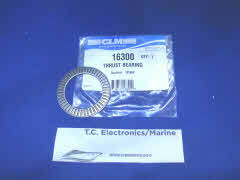 Electronics/Marine tech (Wayne Coll) will sand blast pinion gear end, shim and ship your drive shaft free of charge if shipped to us before we ship parts kit order. 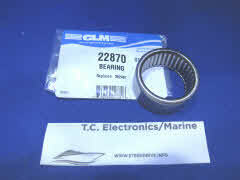 GLM P/N 21610 Drive shaft pinion gear bearing OEM 387817 should be installed with wording readable. The words read this side up. Outside-case must have packing grease removed. Small end has .003 tapper lead to help when installing. When installing, if unit has no resistance or lose when pushed into gearcase location, bearing must be removed and cleaned. Then 680 loctite must be applied to outside of case before installing again. 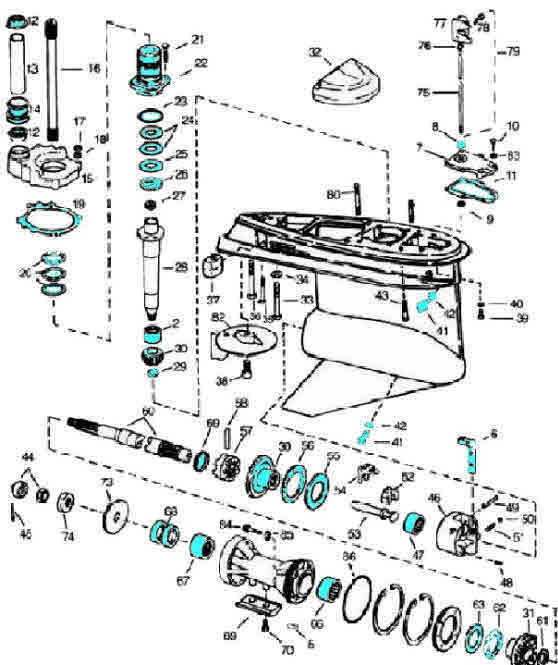 P/N 87656 Cobra 4-1/4 inch large hub lower unit seal kit OEM 387817 kit contains the following items that may require the addition of compounds before the installation process. 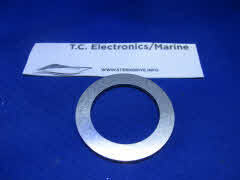 Oil seals require 680 loctite coating on outside diameter of the stainless steel surface area. 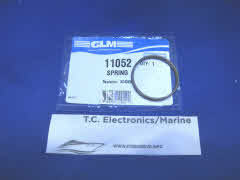 Gaskets and o rings requires Johnson outboard gasket sealing compound. The carrier o ring groove needs sealing compound coating before installing o ring, then compound applied to outside on o-ring. 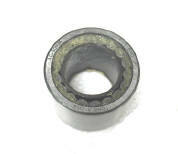 Wiper seal requires gasket compound on outside and any type of wheel bearing grease placed on the inside area. Lower tube guide seal requires coating of gasket compound. Upper tube guide and one end copper tube should be installed in upper gear-case with 680 loctite. This should be applied 2 hr or more before placing upper-lower gear-cases together. P/N 27720 Detent is a shifter assembly upgrade made by OMC in 1991. Upgrade as listed below OEM 915954 Will allow shifter rod assembly to find center of forward and reverse location. The old version had 1/8 inch or more play when moving shifter rod in neutral location. This now allows the installer to measure base to top of rod end receiver. This neutral or center reading should be 7-.156 inches or 8 turns. Upgrade has built in tapper lead on both side of detent. This allows shifter rod to go into forward and reverse gear with about 7 to 10 lbs. Old detent shifter rod was about 15 to 20 lbs. to move rod. Modification now places less pressure on shift cable. Less wear on clutch dog and forward gears as shift cable sides in and out of gear easier. Shift cable life expectancy with modification will last longer with 10 lbs. less pressure on metal cable when changing gears. 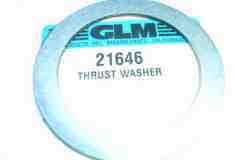 GLM P/N 27770 Housing assembly OEM 984462 Shim drive shaft and pinion bearing. Grease inside and place the three o ring in the groves then add gasket sealing compound on o rings. Place smaller 2 inch o ring on smaller grove and add sealing compound. 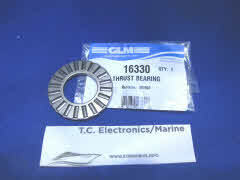 Please see shimming video or send parts required in for our tech to shim for you. OEM P/N 987670 Original Cobra parts pinion gear, nut and forward gear set included in kit for V8 Chevy / Ford motors. 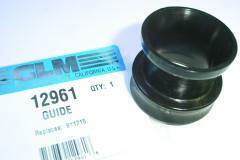 GLM Marine P/N 22623 Forward / pinion set included in rebuild kit for 4.3L V6 Chevy motor. P/N 21731 Magnetic draining screw with seal OEM 318544 two drain plugs are included in this kit. P/N 22910 Forward gear bearing for lower unit gear-case OEM 389039. Clean outside of case with lacquer thinner. Install so you can read writing the instillation. Retaining grease is required to keep pins in-place during installation. Add oil to free up bearing after forward gear-prop shaft is installed. 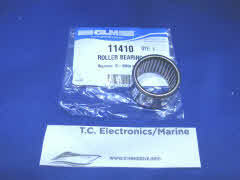 P/N 11410 Prop shaft carrier bearing OEM 387247. Years 1986-1987-1988-1989 and 1990 out-drives with 1-3/16 inch drive shaft. Install so you can read writing on bearing after instillation.